How to wipe browsing history? Do you want to wipe browsing history? Are you searching software so that you can completely wipe web history? Well, then no need to worry you can wipe your internet history by using Drive Wipe Tool. These days, all of you want to keep your personal details confidential while browsing web. Wiping history not only keeps your details private, away from hackers, but it also helps to free up some space on the hard drive. While you were browsing web, search engine remembers lots of information for you like sites you have visited or files you have downloaded etc. This information is called internet history. The items viewed by you are all saved on computer hard drive. The webpage that you have visited frequently load faster by loading files from hard drive instead of downloading the web page again. However, if you share a computer with someone or using public computer, you may not want others to be able to see your web history. To keep Internet browsing private, you may want to delete Internet History. It is good practice to wipe web history regularly, both to protect your computer and your privacy. If you do not wipe regularly then files takes more disk space that have been downloaded and result the computer to run slowly. Therefore it is useful to delete unwanted files from taking up disk space. Sometimes, when you are browsing you may be thinking that you have nothing to hide and so no need to worry and you do not care about web history. But just like having an unlisted phone number and spam filters on your email, your privacy is important and should be protected. If hackers access your computer they can see where you have been. This includes passwords and account information if you ignore to log off the site before you closed the browser window. Beside browsing and download history it also includes form and search bar history, cookies, cache, etc. 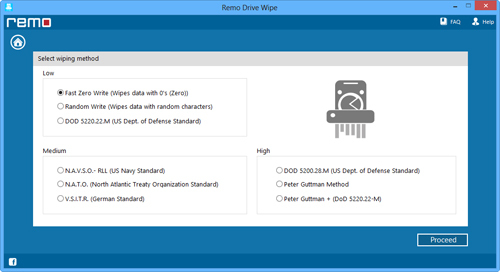 This software has the ability to erase data completely from hard drive of different types such as SATA, SCSI, IDE, etc by using different sanitization standards such as fast zero overwrite, random overwrite, etc within just few clicks. 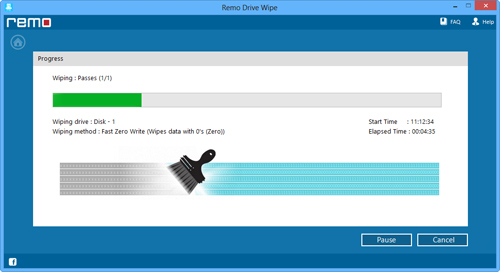 Drive Wipe Software is the best in market with which you can completely wipe browsing history. It uses nine different shredding patterns. These shredding patterns overwrite the drive with junk or garbage values and anyone who will try to access information will get nothing but junk data. This tool is easy and comfortable to use. This application also plays a vital role to wipe laptop hard drive to prevent it from hackers because your laptop may contain confidential files or important data like financial records, account number, passwords, etc. which you do not want any body to know. But the hackers may recover your data, misuse it and you may face trouble. 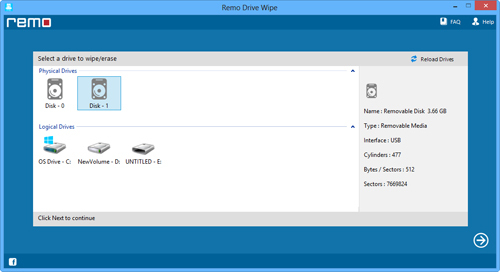 This tool also helps to wipe drive on Windows operating system such as Windows 2000, 2003, Vista, 2007, 2008. Step (i): Install the software Drive Wipe on your system. Then select the drive where the browsing history is stored as illustrated in Fig A. Step (ii):Select any of the nine wiping method and then click on "Next". The software will start wiping and all the data will be overwritten by junk values. Step (iii): After wiping process you will see a message that particular web history is wiped successfully.